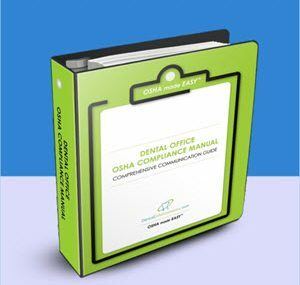 Every dental office is required to have a current / comprehensive OSHA Manual. Getting a new one at least every 5 years, ensures all information stays up-to-date and timely. This is even more important due to the Federal requirement for dental offices to be GHS (Global Harmonization System) compliant by December 1, 2013. Get our OSHA/GHS Manual today that meets the new OSHA/GHS Standards. It is also vital to properly complete all sections of your OSHA / GHS Manual including the many employee forms that need to be filled-out, organized and signed by every employee in your office. This process can be labor-intensive with many levels of paperwork to design……Ugggh, sounds like a lot of work, and it is! Personalized Employee OSHA Forms Packets We customize and compile these per each of your team members. You simply sign and file the forms! Yearly OSHA Form Organizer the perfect insurance during OSHA Inspections. Stay completely organized. 30 Minute “Easy Training” Phone Session to review the materials with your office’s key contact person. GHS COMPLETE COMPLIANCE SOLUTION. Click to view that item.